I have anxiously awaited the writing of this post. Although many statistics, information, and ideas come about with this subject, I’ve postponed writing until the right words could shine through. Chances are, the people reading this are not the ones abusing and neglecting animals. However, those reading this are still impacted by animal cruelty. The disgustingly horrific photos and videos that are seen on television, the internet, and in the news, often leave animal advocates and animal lovers disheartened. There is no harsher feeling than seeing an animal being tortured, knowing that animal abuse exists, and having no idea what to do about it or where to go. Here are things that everyday people like you and me can do to help prevent and potentially stop animal abuse. The legal definition of animal abuse is the crime of inflicting physical pain, suffering or death onto a tame animal, beyond necessity for normal discipline. It can include neglect that is so monstrous that the animal has suffered, died, or been put in imminent danger of death. 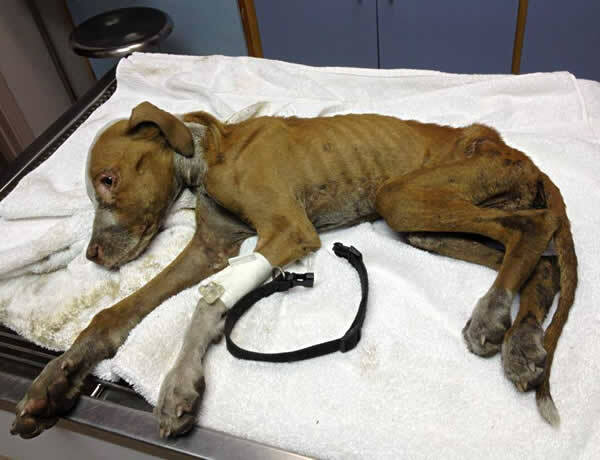 Animal abuse is commonly known as cruel acts and neglect. Psychological terror and torment is also a form of animal cruelty, for example: the constant creation of fear by the owner to the animal. Are all forms of animal cruelty. 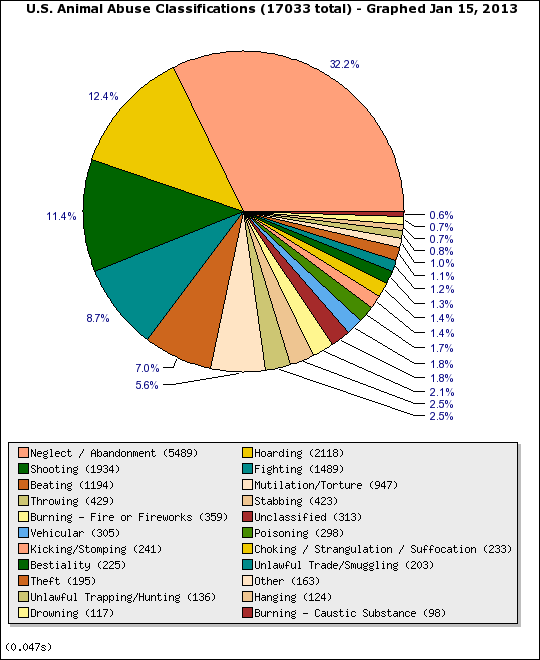 Below is a chart defining the frequency and types of REPORTED animal abuse cases in the United States in 2013. A quick mention on obesity in the US: A stagggering number of American pets are obese. Although this is not a direct form of abuse or neglect, obesity can and often does create many health challenges for the pet and can and often does, limit the animals life longevity, and health. Routine exercise is an essential need for many animals. May perform acts of cruelty or torture for religious, cultural, or artistic reasons. Most likely have psychological/ personality/sexual disorders. Antisocial personality disorder in particular revels the highest incidents of intentional animal cruelty according to Psychology Today. A woman you work with often comes to work bruised. She admits that she and her children are a victim to domestic violence by her husband. Given the woman’s testament, would you consider her dog to be safe in the household as well? Learn the signs of animal abuse. Notice your surroundings and environment on a daily basis. Some signs of abuse and neglect are quite evident. However be careful in drawing assumptions. The owner may have brought the animal indoors between these two times, however since you are at work, you are not able to see that fact. When presenting an accusation of animal cruelty, it is imperitive that your observations/facts be concrete enough to stand up in court. Create a record or log documenting what you see on a daily basis, the animal’s location, health condition (skinny, dirty, mange-like, etc), living conditions (no shelter, living in feces, etc) Take photos if possible. In general, it is not wise to confront the animal abuser yourself. Law enforcement personnel are trained to deal with situations such as this, because remember; animal abusers may also be violent towards human beings as well. Even if it means continuous phone calls to law enforcement or someone else of authority. Even if they don’t seem to care (they could be animal abusers as well) Keep placing complaints, making phone calls, and advocating for the animal. In some U.S. states such as New York and Texas, dialing code 311 will put you in direct contact with someone who can help with animal cruelty. If you are witnessing animal cruelty as it is happening and the animal’s life is in imminent danger, call 911. If you have viewed animal cruelty on the internet, click here to report it. You can also click here. You may need the direct video link when reporting or in some cases, the IP address of the website. In order to assist law enforcement, this link allows for easy look-up of the website creator’s contact information. This seems a very after-the-fact avenue and for the most part that is true however the local animal shelter is where many neglected and abused animals end up. Many of these shelters are non-profit and depend solely on contributions made by their community to care for their animals. Help the relief effort by volunteering with your local shelter or providing donations if possible. Which could mean organizing a citizens’ initiative/petition or writing your local representative and advocating for tougher animal rights laws. Right now in Denver, CO, efforts are being made to legally prohibit convicted animal abusers from ever owing an animal again. 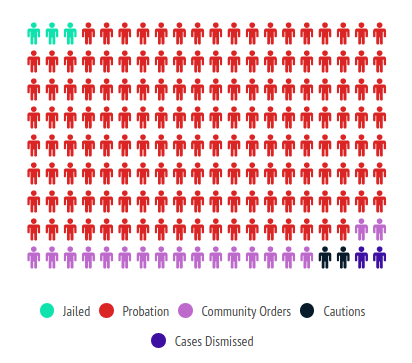 Similar legislation exists in California. Although many US states have felony laws for animal abuse, SOUTH DAKOTA is one of the US states WITHOUT felony-level animal cruelty laws. 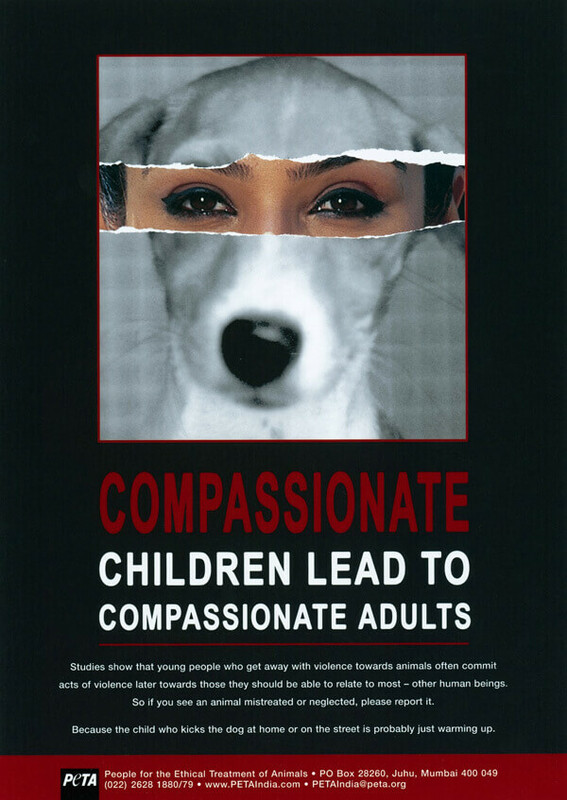 Educating youth on proper animal care can prevent animal abuse in the future. Not everyone understands that animal abuse is NOT okay.